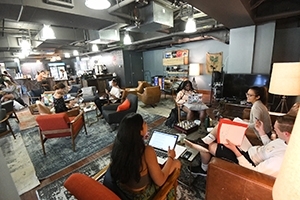 As the American University community prepares for finals to begin, two gathering spaces on campus are ready to welcome students for studying, engaging with friends and peers, or simply taking a break from the finals grind. The Hub for Organizing, Multiculturalism and Equity (HOME), which just opened at the end of the fall semester, provides a space for support and positive interactions among multicultural communities and allies. It's open to all AU students who strive to create a sense of community and belonging and was a collaboration between the Office of Campus Life, the University Center, and AU Student Government. Located in the Mary Graydon Center, HOME can be accessed with the swipe of an AU ID by any student who completes the online request form. The space contains all the comforts of home, with couches and beanbag chairs for lounging, and a television. And for any student in need of refreshments, or perhaps a bit of caffeine to fuel a late night of studying, the Bridge Café on the second floor of Bender Arena is open daily until midnight. The Bridge, which opened its doors to the AU community in 2017, is operated by the University Center and run by student workers. The light-filled space provides plenty of tables and seating areas for meeting with friends and study groups, finishing up end of semester projects, or relaxing between finals. In addition to serving as a central gathering space, the Bridge has also played host to concerts, open mic nights, and other events throughout the semester. Follow the Bridge on Twitter for updates on upcoming events or changes in hours.